Indiana workman's compensation is provided to Indiana employees who are injured in a work injury or who suffer from an occupational illness. Workers compensation is administered by the Workers' compensation Board of Indiana which has been created "to provide efficient dispute resolution for injured workers and employers by administering both formal adjudication and informal dispute resolution services, to serve the public by answering inquiries regarding the Indiana Worker's Compensation system, and to collect statistical information regarding workplace injuries in Indiana". Workers compensation has been created as a compromise between employee and employer. It is a no-fault insurance approach to work injury compensation and medical benefits. Indiana workman's comp allows employees immediate relief from work injury without the need to file a protracted personal injury lawsuit, prove the employer was negligent for their injury, and wait for the courts to award personal injury compensation. Injured employees may not have the time and strength to navigate the complex workman's compensation legal process. If your work injury is temporary or not too serious you may be able to negotiate a fair deal with your employer. If your work injury is permanent or if your employer has denied your workers' comp claim, talk to an Indiana lawyer who understands Indiana compensation laws and can ensure your legal rights outlined in the Indiana Workers Compensation Act are protected. 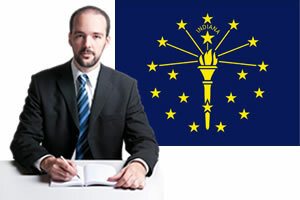 Indiana Workers Compensation laws provide medical care for injured employees and may also provide compensation for lost wages in the form of the following: temporary total disability (TTD), temporary partial disability (TPD), permanent total disability (PTD), permanent partial disability (PPD) and death benefits. Medical benefits - Medical benefits are paid for employees who are injured on the job. Paid medical care can include all "necessary and reasonable" medical care. There are no time or monetary limitations for medical benefits provided to the employee. All medical care is directed by the employer, including the choice of the physician. If the employee does not see the doctor chosen by the employer certain benefits may be terminated. Temporary Total Disability Benefits (TTD) - Temporary total disability benefits are paid to employees who are injured and unable to return to work. TTD benefits are paid at 2/3 of the injured worker's weekly wage. Temporary total disability benefits may be paid up to 500 weeks. Maximum and minimum rates are established under Indiana workers' comp law. Temporary total disability payments do not begin until after a seven day waiting period. Employees may begin receiving TTD benefits on the 8th day of disability. If the worker is unable to work for at least 22 days the employee may receive TTD benefits for the first 7 days of disability. Disability payments should include all of the employee's earnings. This can include bonuses, earnings and overtime from a second job. A workman's comp lawyer in Indiana can help review your TTD benefits and ensure that you are getting the compensation you deserve. Temporary Partial Disability Benefits (TPD) - Temporary partial disability benefits may be paid to workers who are able to return to work, but who, due to the limitations caused by their work injury, are unable to make the same wage they could make prior to their Indiana work injury. TPD benefits may be paid at 2/3 of the difference between their average weekly wage they made prior to the work injury and the wage they made after the work injury. TPD benefits can be paid up to 300 weeks. Permanent Total Disability Benefits (PTD) - Permanent total disability payments are paid to employees who are not able to return to any type of employment after their Indiana work injury. Under current workers' comp law employees are eligible to receive 2/3 of their average weekly wage up to 500 weeks. Under some conditions, an injured employee may be able to choose to receive a lump sum PTD payment for their Indiana work injuries. Permanent Partial Disability Benefit (PPD) - Permanent partial disability benefits may be awarded to employees who are permanently impaired. Employees may be permanently impaired from a work injury but still able to work. Permanent partial disability ratings are assigned by an Indiana workers' compensation doctor. The doctor will make their rating based on information provided in the American Medical Association's Guides to the Evaluation of Permanent Impairment. Employees who are not satisfied with their impairment rating may request a second opinion or contact an Indiana workman's comp lawyer. Death Benefits - Death benefits are awarded to the surviving beneficiaries of Indiana workers who die from a work injury. Death benefits may be paid for a maximum of 500 weeks and are 2/3 of the deceased worker's average weekly wage. Paid burial expenses may also be paid up to a pre-determined amount outlined under Indiana workers' comp law. Under some conditions, it may be possible for the surviving beneficiaries to negotiate a lump sum Indiana death benefit settlement. Vocational Rehabilitation - Vocational rehabilitation may be offered to Indiana workers who can not return to their previous job due to the functional loss from their work injury. Vocational Rehabilitation can include a variety of services for work comp workers including: a comprehensive evaluation of the worker's vocational abilities, work trial assessments, job placement services, evaluations of a worker's efforts to return to work, and internship options.